I sat down on a bench at the back of the house, I wasn’t really relaxed as I had to hit my palms here and there on my body to scare away the sun flies that tried to feast on my skin. I sat down on the bench with my right leg on the cemented floor of the compound and my left leg on the bench. I supported my left arm with my left leg and rested my head comfortably on it as I stared at Peter. He washed his clothes and we talked about work, education and his words. We continued talking while he washed cloth after cloth and threw it into the half-filled blue bucket close to me thereby splashing water on me. Each time he sprinkled the water on me he would say sorry, but it didn’t end there, the water continued to splash on me as he threw in more cloths into the blue bucket. He picked up one black trouser and spread it out for me to see. It was torn somewhere but he insisted it wasn’t torn that it was loose instead. He asked me if I had a needle and a thread. 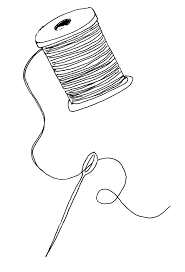 I had a black thread but what I didn’t have was a needle. Or should I say I had a needle but the needle wasn’t meant for clothing fabrics, it was meant for the fixing of weaves. It was as good as not having a needle at all. I said I didn’t have a needle and he wouldn’t be able to use any thread without using a needle for fixing his loose trouser. I knew that even if he used my needle, it won’t be a neat job and the trouser might end up becoming loose again. He nodded his head in acceptance, gave the trouser a long stare with a sigh, squeezed it with his palms and threw it into the bucket for washing. Then I realized that to sew a cloth whether with the hands or the machine, without the right needle and your choice of thread color, the cloth will not be made, even if made it won’t be a good job. That is to say that many people, mostly writers spend a lot of their time and energy trying to get something of great importance done with the wrong tools and wrong methods. They might end up getting the work done but it won’t be as they had imagined it to be or it won’t last at all. Sometimes we don’t do the right thing and expect a good result. He would be able to sew the trouser with the wrong needle but won’t be as he wanted it to be.